A little snack box, loosely based on fish food. We have apple and breadsticks with peanut butter and sprinkles served with rainbow drops and sea fruit shapes, the idea was that T would dip the apples and breadsticks into the peanut butter then into the rainbow drops and fruit shapes, but he didn't want to do that. He completely deconstructed it, ate all the breadsticks and apple first, then the rainbow drops and fruit shapes then used his finger to dip into the peanut butter and eat that ;) Oh well, he ate it all! We have a pinterest board dedicated to all things 'ocean themed' for small children, have a look for some ideas, or better still follow us, all of this months ocean blog posts will be added throughout the month. We will be tagging all of our activities and food with #booboxocean if you'd like to follow or join in over on Instagram or twitter. All the ocean themed posts on the blog can be found here. Linking up to Fun Food Friday at Eats Amazing for this post. Wonderful snack and I like the idea of a few sprinkles in Peanut Butter. I have an ocean themed activity post - http://eclecticlamb.com/2013/06/21/under-the-sea-day-preschool-camp/ I also have two ocean themed bentos http://eclecticlamb.com/2013/05/16/under-the-sea-bento/ and http://eclecticlamb.com/2013/02/18/shark-bento/ Thanks! This is really pretty, I love the idea of providing all the bits for dipping, will have to try something similar! 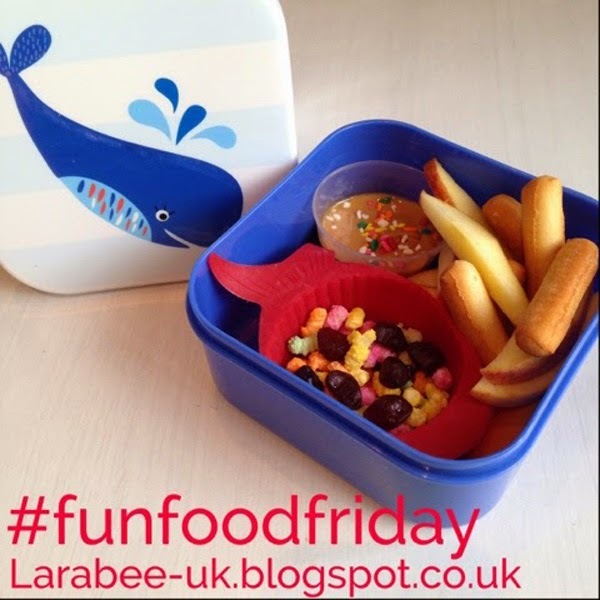 Thank you for linking to Fun Food Friday!